1. Mapping all assessment items to the CS and levels of Miller’s Pyramid. 2. Student self-assessment of their progress against the CS. 3. Combination of mapping results with the students’ performance to produce a traffic light report for each student (green – ‘acceptable progress’, amber – ‘borderline’, or red – ‘improvement required’). Self-assessment results were included as a comparator. 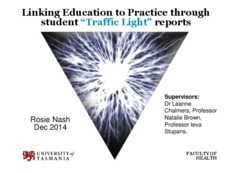 A feedback survey evaluated students’ understanding of the CS and their perceptions of the traffic light report. RESULTS: Of 163 BPharm students (Semester 1, 2014), 103 consented to participate; 69 completed the self-assessment. Preliminary analysis from the survey (n=72) indicates understanding of the relevance of the CS has increased since a previous 2012 survey (83% vs. 67%, p=0.01). Forty-four percent of students believed that their self-assessment corresponded with their actual assessment. Qualitative responses suggested the report was seen as valuable in illuminating the CS within the program; 68% requested to receive it again in Semester 2. DISCUSSION: Preliminary analysis indicates that the traffic light report was associated with an increase in student understanding of the relevance of CS to pharmacy undergraduates during their degree. Students may require additional support in self-assessment but they are positive about continuing to map their progress using this tool. Further data analysis, repeated data collection and validation is planned for Semester 2, 2014.